I’m grateful to be able to save partial posts since I get tired writing longer reviews on my iPad and have to save and come back to it later. I should say upfront that Atelier Crenn is my favorite restaurant in the Bay Area right now, so that probably makes me biased in favor. And before I forget to comment on service: service was very good, tables were very close together, bar was empty during the first dinner service. There was a $72 prix fixe menu and a few extras that you could order. Everything on the menu was good and some items were noteworthy. 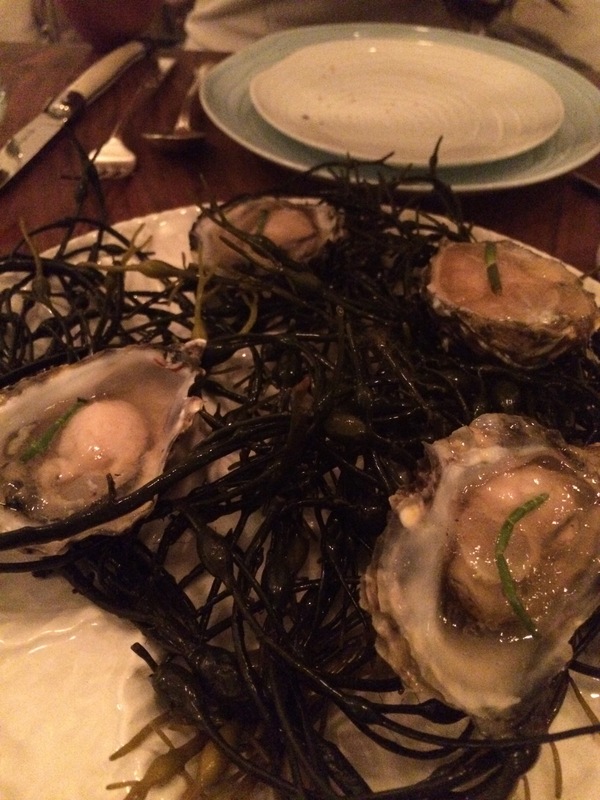 Oysters with candied fennel. I’ve never had a sweet topping on oysters before and it was eye-opening how much the sweetness of the candied fennel brought out the oyster’s umami. Usually you have an acidic mignonette bringing out the minerality, so this was new for me. I wonder if an off-dry white would pair better with this dish than traditional muscadet. 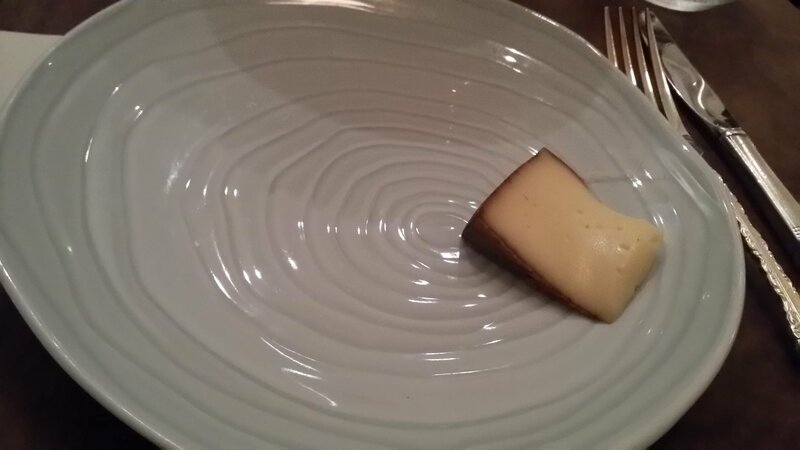 A thinker of a dish. Octopus with veggies. The octopus arrived atop a bed of spinach and the spinach stole the show. Best spinach I’ve ever had, didn’t expect that. Octopus was soft and left as a whole chunk. I’m not opposed to cutting things myself but with octopus there’s room to play with texture depending on how thick it is cut. Baby potatoes were excellent, I could have eaten an entire plate of potatoes and spinach. Grilled cabbage. Yum, loved it, one of my favorite courses. There is a cooks illustrated recipe for grilled cabbage with a vinaigrette and I will have to try it. Trout was simply prepared and showed off a mild but pure flavor. Whole fish was deboned at the table, great presentation and also allowed my to eat my favorite morsels near the head. 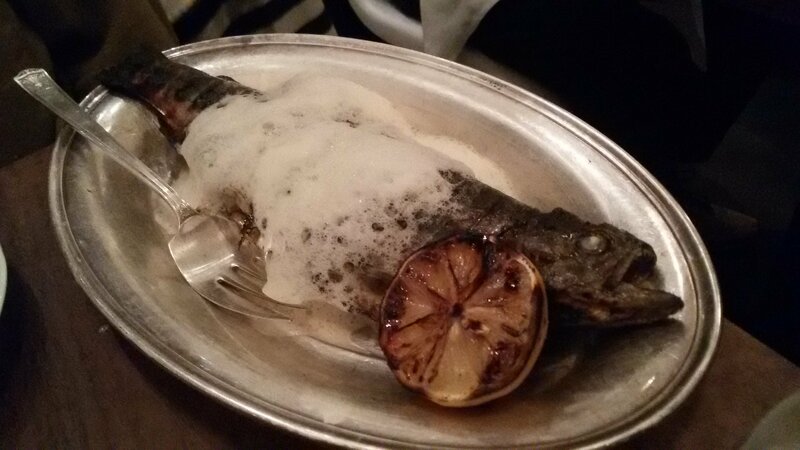 The foam atop the trout was decorative and did not play a significant role in the dish. Salad was simple, topped with a gruyere cheese crisp that could make any salad special. Salad was served with a cheese course, pomerol in our case. Gateau breton was incredibly buttery and had a nice texture: crispy on the outside and enough air pockets in the middle for a soft bite. 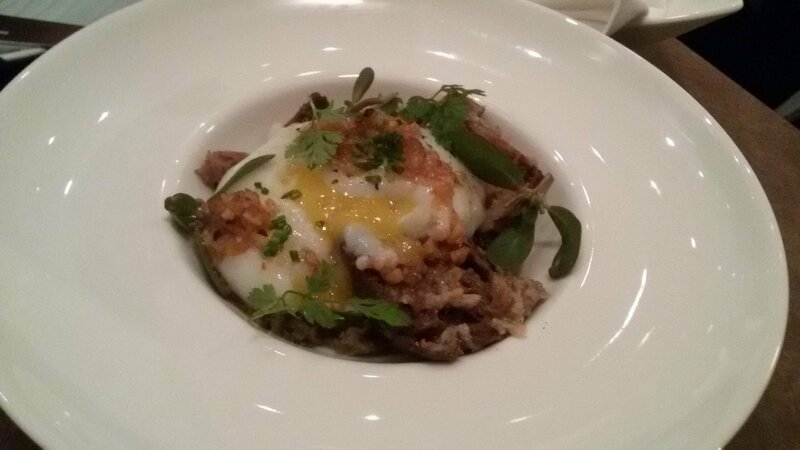 In addition to the PF menu, we also ordered three extra dishes: abalone, egg, and mushroom. Egg was not remarkable since so many restaurants can make perfect eggs these days. Abalone was one of the best versions I’ve had, the other two remarkable versions being at Manresa (tide pool) and Coi (served with toasted breadcrumbs). It was certainly the best cooked abalone, cooked through barely with the texture similar to geoduck clam. If the dish composition was a little more complementary, this dish would be the best of the three. But the other two dishes are better composed even though neither of them achieved the perfect texture. I think texture is the biggest challenge with cooking abalone since it can be so tough, or on the opposite end, braised and flavorless. Even in sushi I tend to dislike its texture. Anyway, this dish was a big surprise to be able to upstage two other incredible abalone dishes. Mushroom. Multiple flavors and textures, and reminded me of my favorite dish at Atelier, a walk through the forest. This version was 10 times simpler, but very enjoyable and brought back fond memories. 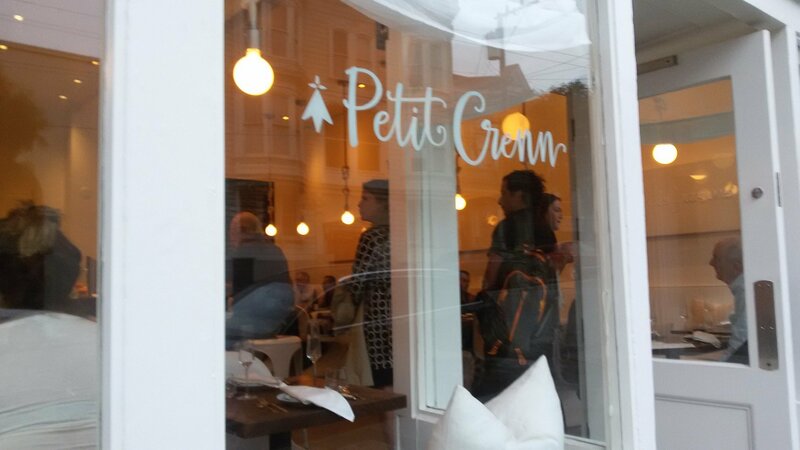 With plenty of simple straightforward and tasty dishes, I think Petit Crenn is easier to understand and like than Atelier Crenn, and of course easier on the wallet. But for people seeking new or unconventional, there’s a bit of that thrown in too. I don’t know which Eric Bordelet pear cider they have. One time I had their cider and oysters at the same time, and they matched up well. Eric Bordelet is a cider maker from Brittany that makes cider like others make fine wine. and his pear trees are old growth pear trees. so the result is not like the $3 mass market cider out there. 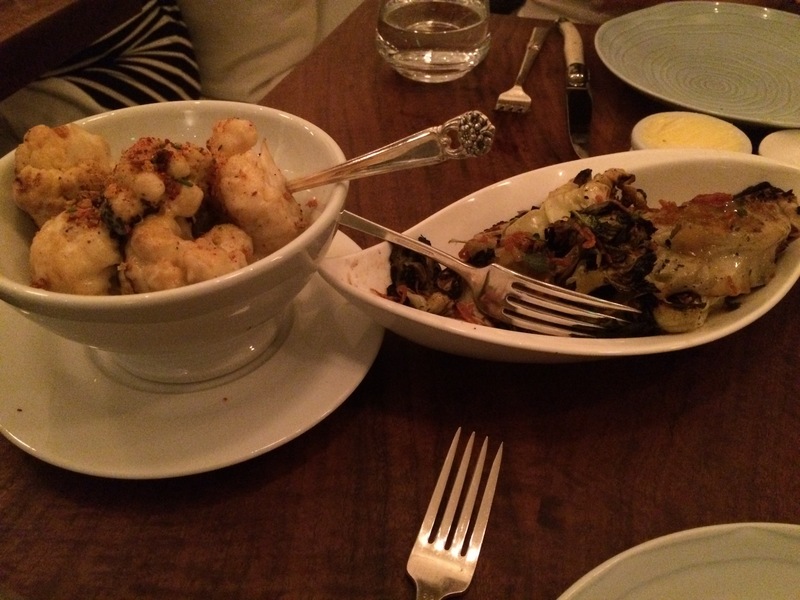 I went to Petit Crenn for dinner on a Friday a few weeks ago at the end of August. They seated my dining companion and I in a two-top. Small restaurant, under 30 seats. They do two seatings a night, and reservations were required. Cheese gougeres - I forgot what cheese was in these but it was salty and creamy. Excellent. Pickled onion on top gave a nice touch of acidity. 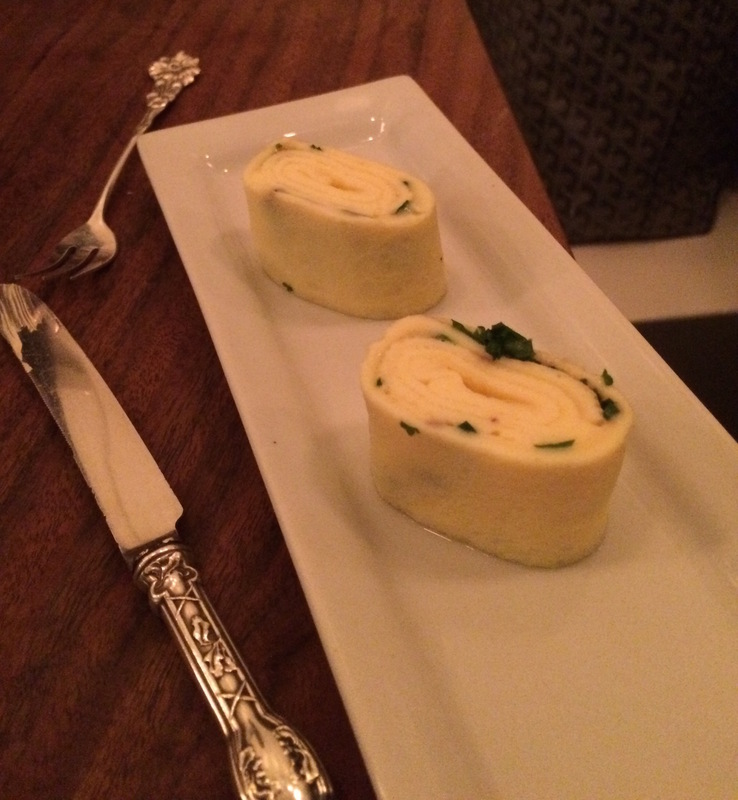 Omelette - a classic french omelette, perfectly cooked and folded, creamy in the middle. I wish that I could make eggs like this. Oysters with smoked tomato gelee and sea beans - this was also excellent. The gelee looked a little odd on the oysters but it complemented them nicely. 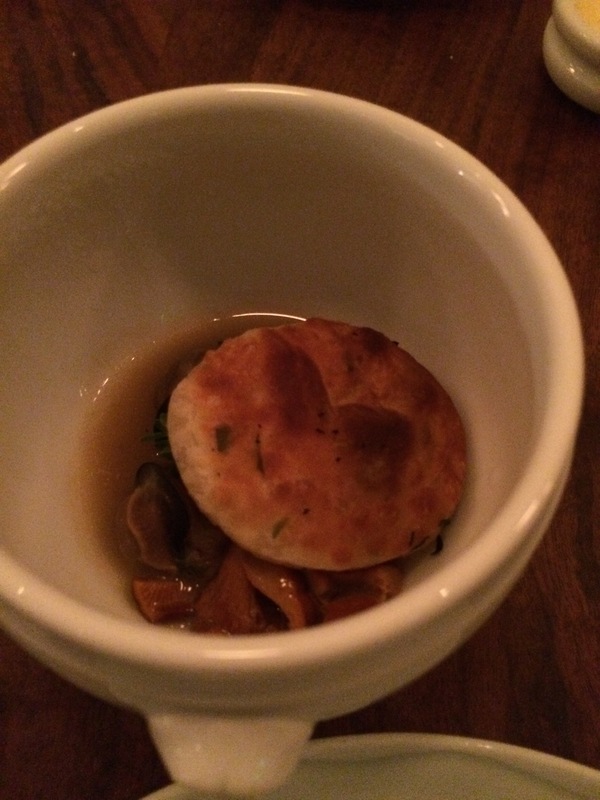 Escargot, chanterelles, and puff pastry in a mushroom broth - Fine, subtle flavors. Whole rainbow trout with cider sabayon - whole fish, looks like one fish was served per two people, which turned out to be a pretty big portion. Our waiter asked if we would like her to debone it, which we did. Like Felice I couldn’t really taste the cider sabayon “foam" but the salty skin had a nice crunch. They cooked the fish to about medium. Cauliflower gratin - cheesy cauliflowers. Grilled cabbage, crispy shallots charred leeks vinaigrette - fine. After this came a little gems salad with tomato and anchovy caper vinaigrette - good simple salad, also had a parmesan crisp. 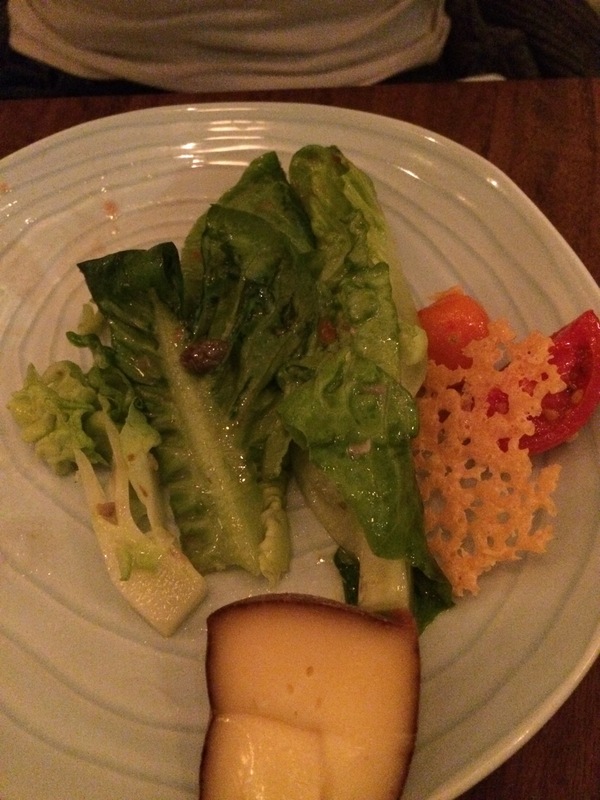 They also sliced a piece of cheese tableside and served it with the salad. I don’t remember the name but it was good, tasted of walnuts. 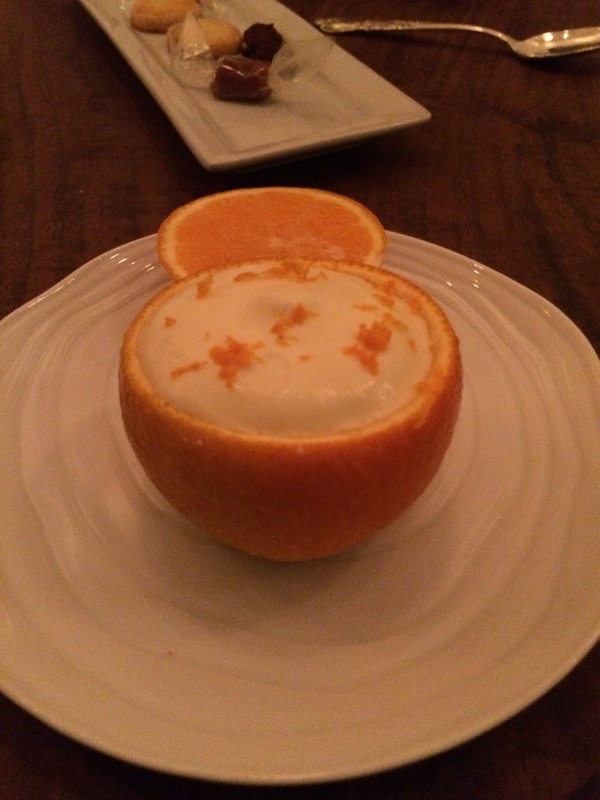 Citrus mousse - Pretty presentation in a hollowed out orange, airy and creamy. Like an orange creamsicle, only without the artificial taste and with an intense orange flavor. Also had a small glass of cider ($6), which they serve in a ceramic cup. I haven’t been to Atelier Crenn, but I’m guessing Petit Crenn is completely different experience. 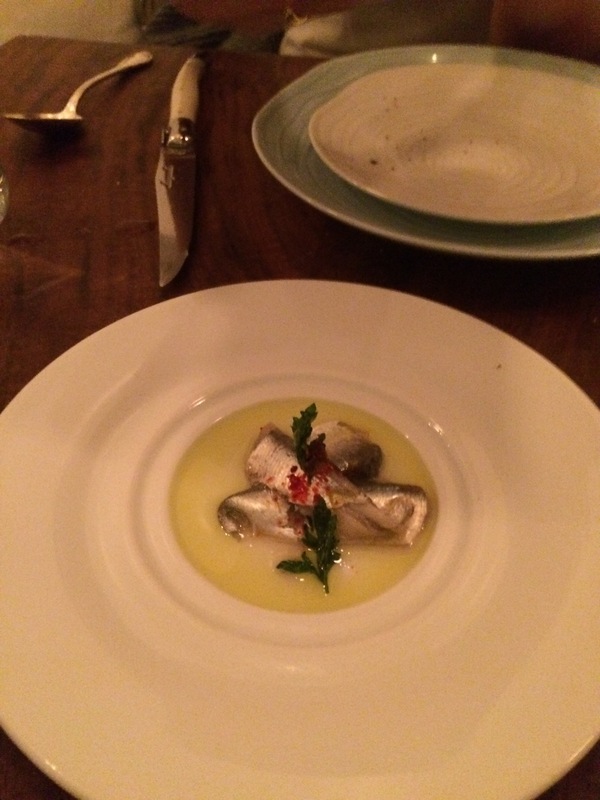 Obviously a lot more rustic and traditional - the only molecular gastronomy touch was perhaps the gelee in the oyster dish. A good meal. Also, since the $72/pp included service, I felt price-wise also not too bad a deal for the amount and quality of food served. Felt pretty stuffed afterwards. Eric Bordelet is an outstanding producer! I really like Dominique Cren’s approach, and definitely NEED to get to Petit Cren. Thanks for the reports! Oh yes thanks for reminding me. That omelet was very good! It was so moist yet fully cooked. I could’ve definitely eaten a lot more of those. We were stuffed too and because of the extra courses, I could only eat 1/4 of the fish and took home most of my dessert. I have zero desire to try Atelier Crenn but this looks more to my speed. 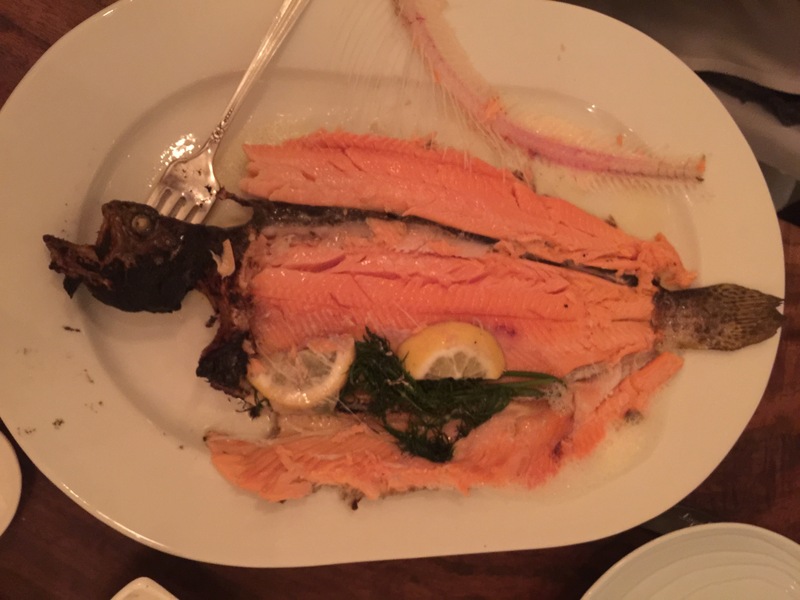 I also have no problem eating whole head on chickens or whatever but the trout look like he is screaming for his life at being splayed open. thanks for your post! my sister and i love AC, and have reservations for our first time at PC later this month. can’t wait! We went last night. I enjoyed it but don’t quite agree with Bauer’s recent review. 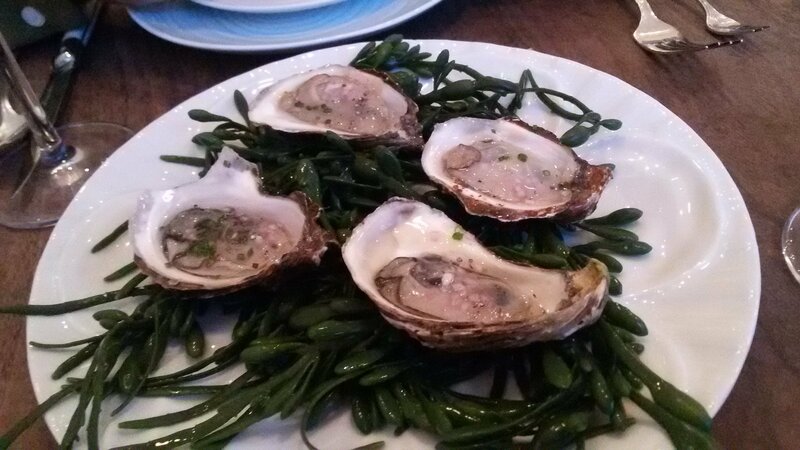 The oysters to start the meal were fantastic, both the oysters themselves and the mignonette. I also really enjoyed the mussels and the carrots that came with the whole trout. Oh, and the Far Breton served for dessert was outstanding. Service was a bit hit or miss. 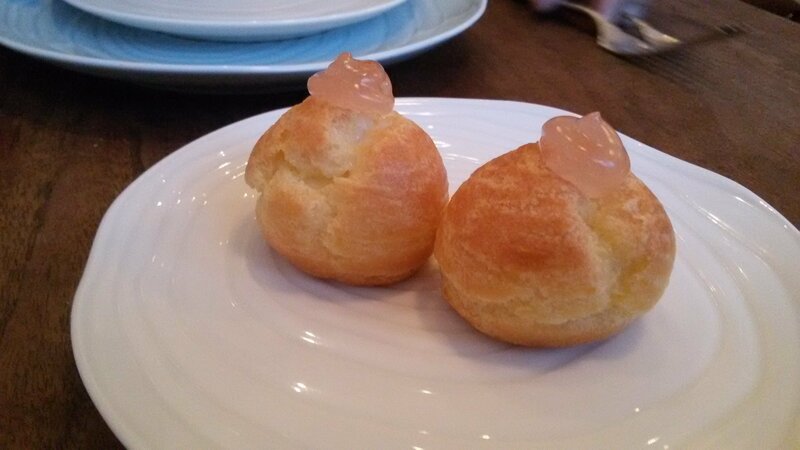 At the beginning of the meal they serve gougere, which our server pronounced as “gruyere”. I know that’s a nit, but come on. The first real course (the oysters) arrived before our drinks. 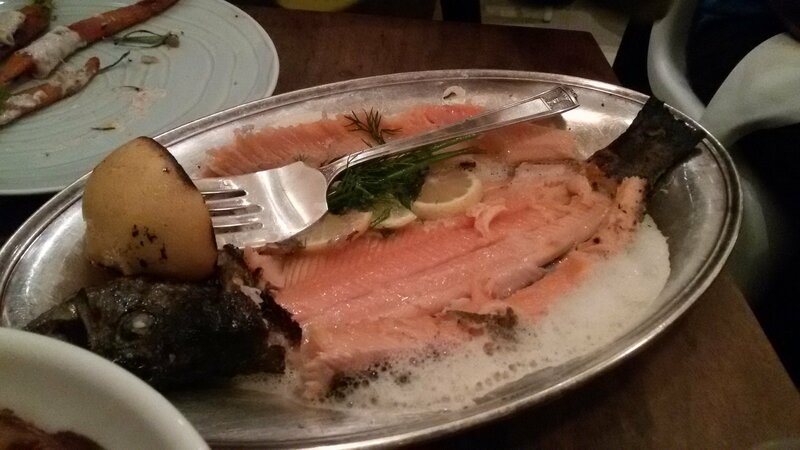 Also, the tableside de-boning of the trout (slightly overcooked) was clumsy at best. All that being said I think Petit Crenn fills a nice niche (sophisticated but still casual and approachable). They mentioned last night that they’re going to be starting breakfast and lunch service soon (sounded like Fridays and Saturdays only), and that will probably be lovely in that space. As I mentioned I don’t agree with Bauer’s high praise, but the potential is definitely there. We went to PC last for the first seating. 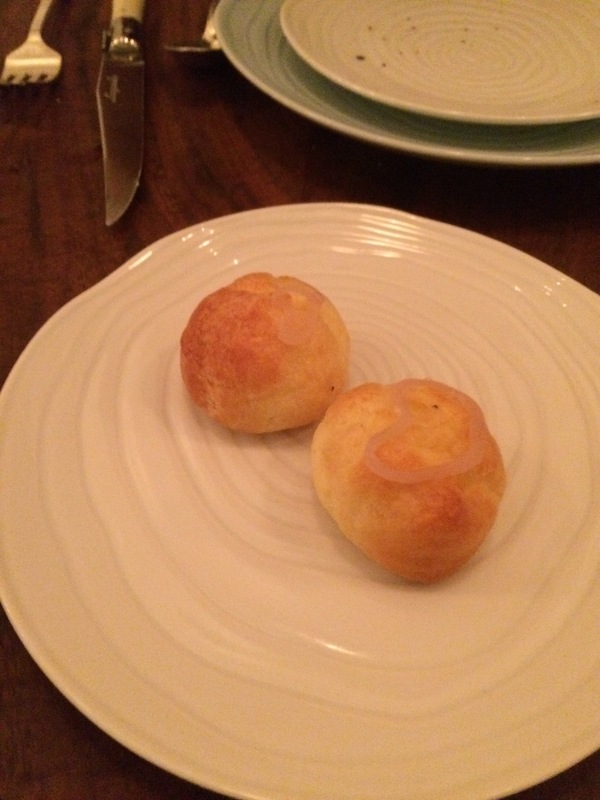 First up were a couple of gougeres, topped with a shallot gelee. Slightly warm, cheesy, oozy – very good. The gelee was a nice, sweetish touch. Next, four La Saint (New Brunswick) oysters on the half-shell, with a caramelized fennel mignonette and grains of paradise (a peppery spice from South Africa). Delicious. quite a disappointment. They were incredibly small , the mussels themselves, and rather dry. The plate – not a bowl – held only the scantest amount of broth at the bottom, and you had to dip each mussel into the small puddle to moisten them. The Josey Baker bread was fantastic – a crusty, craggy, toasted sourdough, better than some I’d had at Heirloom Café a few months ago – as was the cultured butter. A chunk of buttered bread dipped in the broth, with a tiny mussel atop, and some strands of leek draped over made for the perfect bite. There was a supplemental menu you could order individual items off of (my bubbly cocktail, for instance – a really lovely sparkling wine concoction made with macvin du Jura – a sweet wine – and chardonnay, as well as a splash of the bubbles), and we ordered the soft poached egg with a chestnut vinaigrette over “burnt bread”. This was clearly meant to be a very comforting dish – the egg white was softer than the center – a feat in itself, to me – over toasted bread (there was nothing burnt about it, or even charred), and then soaked through with the vinaigrette. It was tasty, but lacked some other texture, as it was all mush. Maybe not soaking the bread would have helped, or a topping of crispy fried breadcrumbs. Next came our “main course” – three dishes at once: a whole, wood-fired trout in a cider sabayon; a potato gratin of gruyere mornay and espelette; and roasted carrots in sumac and yogurt. 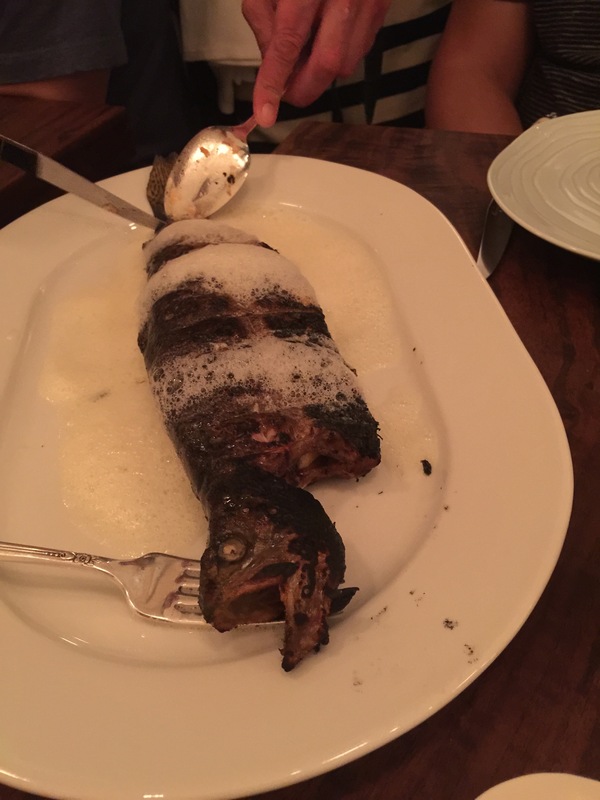 The fish was beautiful, and boned after it came to the table; the “sabayon” was in the form of a foam. Unfortunately, the trout was overcooked and mushy in places. Not all of it – some of it was very good, with a nice delicate flavor – but enough to note. Neither of us could discern the cider sabayon after the fish was boned. The gratin (pronounced “grateen” by one of the expediters; I’m sorry, I know that’s snobby and nit-picky, but she also didn’t know a couple of things we asked her about the dishes [though she did send someone over to answer our questions], and at that caliber of a restaurant, I would think everyone would know their stuff) was delightfully cheesy but the potatoes had an acrid, over-caramelized flavor. I’m a potato freak and I wouldn’t order that dish again if it were an option. 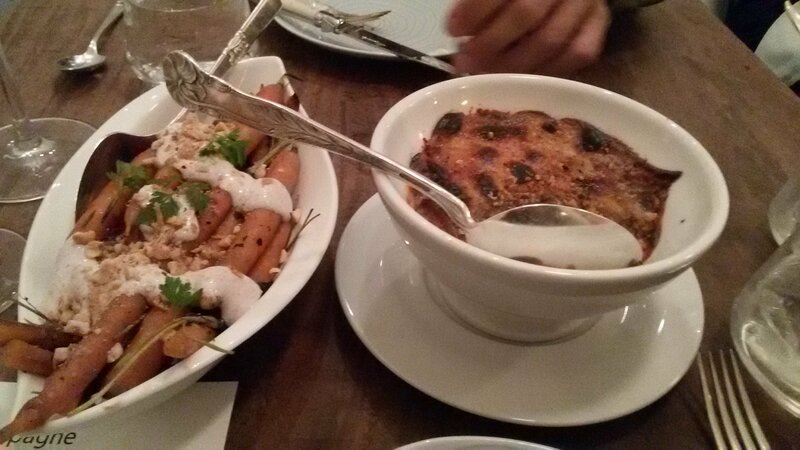 The carrots were wonderful – sweet, smoky, tangy from the yogurt…. They may have been my favorite item of the night, and I didn’t finish them and asked to take them to go. Sadly, somehow someone misplaced them and they could not be found at the end of our meal. 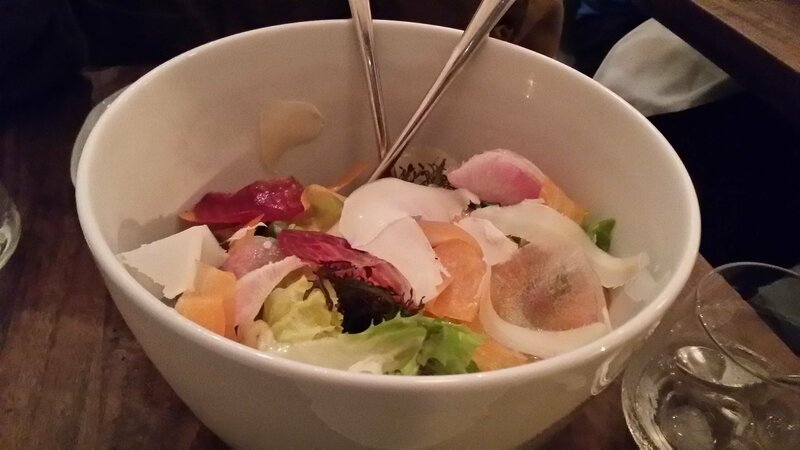 Next was a HUGE salad bowl of fresh seasonal greens with fuyu persimmons in a cider vinaigrette, and some thinly slivered cheese, as well as a triangle of Breton cheese (I missed the name) that had an appealingly horsey smell/flavor to it. The salad was lovely, but too much too late – we were too full to enjoy it. – another very comforting dish, but unfortunately, it was really bland. 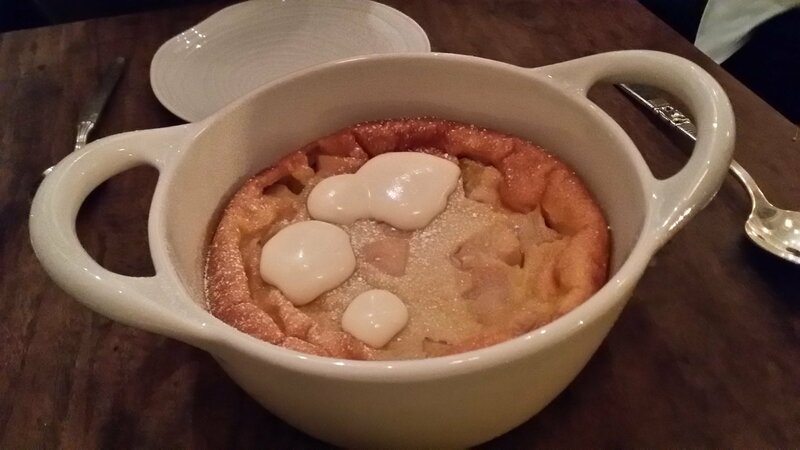 It needed something tart, or even something sweeter than it, to liven it up. By no means bad, but just rather dull. 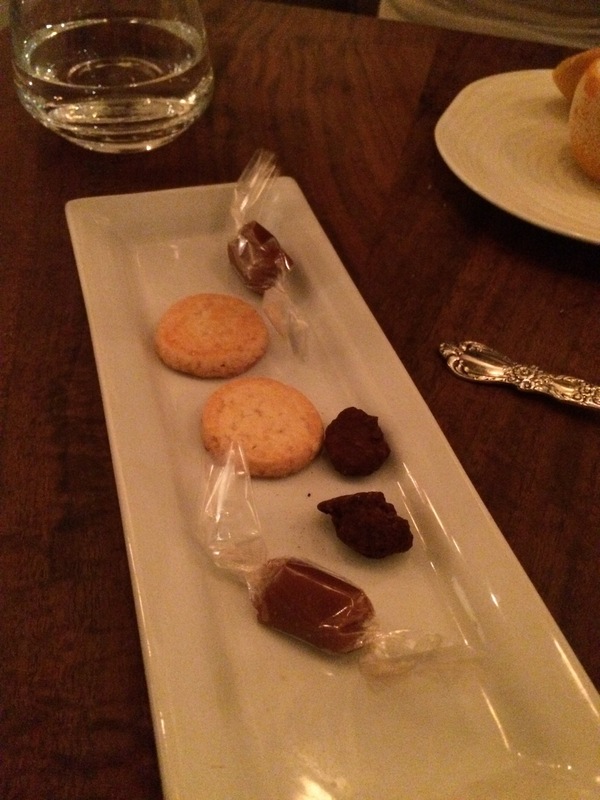 Finally, the mignardises (no pics) – a truffled chocolate ball (excellent), a caramel (very good) and a little cookie of some sort. The price is more than fair for so much food, but I think the concept is off. For me, if you’re going to make soulful, rustic comfort food, perhaps there should not be 9 courses. In France, you might get the trout, the gratin and the carrots for a prix fixe of 35 euros, and that would be a good, filling dinner. There was too much food and not all of it was up to snuff, we felt. different. I might like to come back in a year and see how it has fared. But right now, I’m not dying to return anytime soon. Breakfast is now served from 8am-11am and lunch is served from 11am-2pm. No reservations. Crepes, eggs, tartines, pastries, etc.